You are here: Home / BLOG / General / Throw your own St. Patty’s Party! Throw your own St. Patty’s Party! Instead of spending hours at the bar trying to order a beer, why not throw your own St. Patty’s bash? We have everything you need to keep the party rocking all night. -A/V Equipment: Skip the DJ and make your own playlist. Just about anything (Lap top, iPod, most smart phones) will plug into our commercial grade speakers. We also carry karaoke machines! -Bars: If you want something more exciting then a regular table, consider adding a bar. This two tiered table comes either as a self serve or bartender type table equipped with linens. Bars start at just $50 and can be picked up from us or delivered to you. -Dishes: Who likes to wash dishes? If you rent dishes from us, you don’t have to! Deck out your party with matching tableware sets. We offer several different types of plates, silverware, and glasses. Starting at just $0.40 a piece you can’t go wrong! -Glassware: The most important step to remember is glassware. You can REALLY wow your crowd by serving green beer in a pilsner glass. 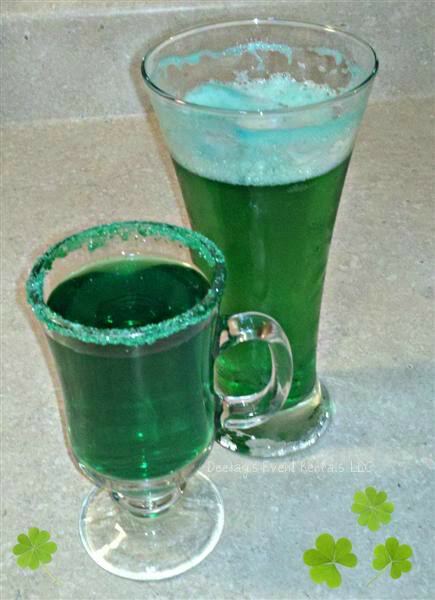 For the non-alcohol drinkers try making a fizzy green ginger ale in an irish coffee mug! Check out our instructions below for tips on making sweet green drinks. http://deejayseventrentals.com/wp-content/uploads/stpattysMedium-1.jpg 600 435 Lauren http://deejayseventrentals.com/wp-content/uploads/DeeJaysSiteLogo-300x154.png Lauren2012-03-15 14:34:242016-01-24 19:19:23Throw your own St. Patty's Party!